It has finally arrived, the granddaddy of all football products. 2018 Panini National Treasures has been out for a little over a week and has almost 5,000 sales on eBay already. As always, the product has some crazy patches, on-card autographs and even cut signatures from Hall of Famers, historical figures and even Dwayne “The Rock” Johnson. The following cards are some of the highest-selling or key cards from this product to change hands thus far. This is one of the highest selling 2018 football cards so far. That’s not just National Treasures. That’s from all of the year’s sets. 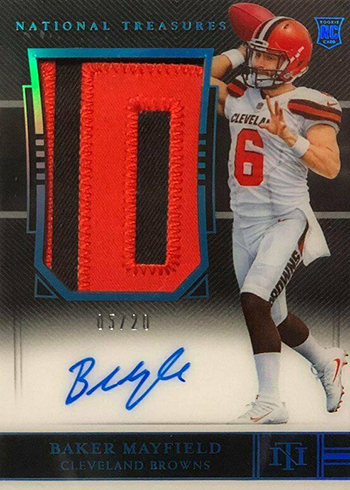 The majority of the most expensive cards from this product will be of Baker Mayfield. Even the more common cards of the quarterback are selling for thousands of dollars right now. What’s better than an autograph of, arguably, the greatest quarterback of all-time? An autograph of that quarterback and, perhaps, the greatest coach ever. Of all the cut autographs in this product this was probably the biggest. The Rookies Patch Autograph cards are one of the main reasons many people buy National Treasures. 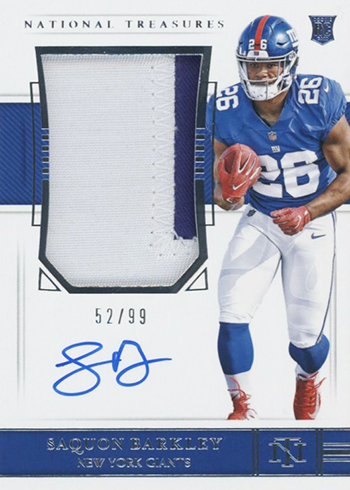 Other than Baker Mayfield, Saquon Barkley is the most important Rookie Card to collectors at the moment. A handful of other Barkley RPA cards have also sold with prices seeming to settle in the $1,400 to $1,500 range for the time being.